This bust of Athena, allegedly a copy of a bronze of c. 430 BC by Kresilas , spotlights one of the most recognized and respected figures in Greek mythology, Athena. 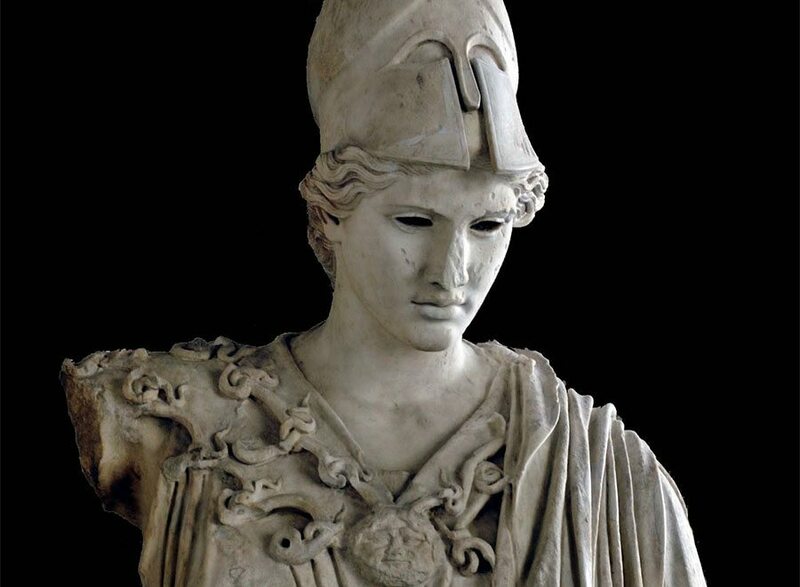 Athena is the goddess of wisdom, strategy, and crafts. Many of her portrayals in Greek mythology reveal her as an intelligent and guiding companion to many of the most famous Greek heroes like Odysseus, Telemachus, and Perseus. One of the more famous stories is about her guiding Perseus to kill Medusa. She is the ideal voice of reason during turbulent times of war in the fabled stories of relations between Athens and Olympia. However, Athena was not only known for her wisdom and level-headedness, but she is also considered to be the goddess of tactical war strategy. As a result of Medusa’s demise, Athena wears the Gorgon’s head on her breastplate to turn enemies into stone. Athena’s penchant for battle is on display in Cresidas’ sculpture. Her combat helmet adorns her head like a crown and looks as if it is meant to not only protect but also to signify her royalty. Even without clear eyes, Athena’s expression is contemplative. She looks as if she is viewing a conflict from Olympia and thinking of the strategy to quell the fight. Cresidas’ expertly balances the thoughtful expression of Athena with her openness to war. She is wearing her breastplate, a sure sign that she is ready for battle at a moment’s notice. At this moment, she exhibits the balance of two natures: an attitude of logic, but a willingness to do battle if need be. This statue depicts a female goddess whose influence and abilities are on par with her father Zeus, and brothers Apollo and Ares. Instead of the impulsiveness the males in her family show, she is a strategic warrior who is a mentor to heroes. The sculpture shows Athena’s character and conveys that her wisdom and willingness to fight are not at “war” with one another. She is thoughtful yet strong, contemplative yet unafraid. Many times in our lives, it can be difficult to feel one emotion but have the strength to act on another. The themes conveyed by this sculpture show that this duality is possible in all of us. What does this sculpture make you feel? This sculpture does indeed make me believe that duality takes or should take part of everyone’s lives. This is a type of defence mechanism where people adapt according to different situations. People know when to be kind and when to be more strict. They know when to be proud and when to be humble. Ancient Greek art can be a great reflection of the human beings and their behavior as well and many people can use it to fine-tune their personalities.